I have recently been placed with this guitar, and I know NOTHING about it, having no Washburn experience at all. ( I did not see any other D42 listings). Would appreciate any/all information regarding this guitar. I would like to collect data, before it is put up for sale. I need the extra space more than I need a guitar. Re: D42SCE Need any information at all! The D42SCE is a dreadnought size (large, but not the largest size) guitar. It has a solid wood soundboard, which is a pretty big deal because the soundboard's tone will improve with age and playing. The sides and back are made of "laminated" layers of wood, which is not necessarily a bad thing. The "CE" part of the model number means that the body of the guitar has a "cutaway" so the player can reach the higher pitched notes at the end of the fretboard and the guitar is factory equipped with an electronic pickup so it can be played through an amplifier or a PA system. Based on the serial number your guitar was made in Samick, China, probably in 2003. With Washburns of this nature, the higher the number, the better the guitar. My first Washburn was a WD32S, a VERY nice guitar...I wish I still owned it, it would be a great road guitar...yours would be a better model than that one of mine. Well, after spending some time with the search function, it appears that you have been in the right place all along. The D46SCE is one of the " Southwest" series. Your original post was in that forum. Take some time to read in the various threads on the Southwestern board and you'll probably find out more than you can anywhere else. The D46 series includes a spalted maple guitar, but yours more likely has a solid spruce soundboard and either rosewood or maple sides and back. It is, no doubt, a very nice guitar. Can you post photos of it? That would help a lot. Most of us seem to use Photobucket and if you use the IMG code in your posts your photos will appear in your posts. 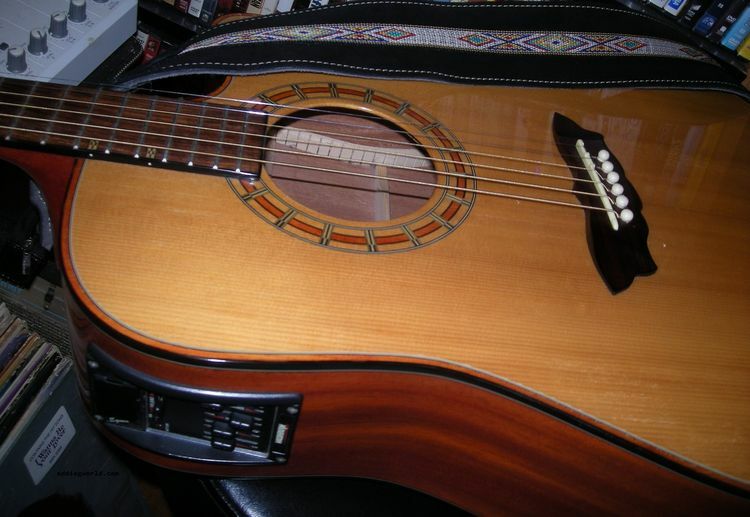 The Washburn 1999 catalog listed my D42-SCE at $699 featuring Solid Spruce Top, Rosewood Back and Sides. 641mm SCALE/44mm NUT. Rosewood fingerboard. Mahogany Neck. EQUIS EXTRA EQ electronics with 1/4" and XLR outputs. Rosewood carved Bridge. Grover 18:1 Tuners. It is a great instrument that has held up beautifully. Sounds fantastic with age! new to group....i have a D42SCE which i bought in 2001...LOVE IT! I would LOVE to have another one just like it as a backup guitar onstage....if anyone has one to sell.